Everytime I show my king size quilt, Green Tile Ceiling, from my Small Machine, Big Quilts, Better Results Craftsy class, I am asked if the pattern is a purchased stencil or how I did it. It is my own design based on the many pictures I have taken of old tin ceilings in restaurants over the years. I really wanted a design that would form a secondary design where 4 blocks came together, and this is the result of several hours of playing. It is simple to do and can be done with pretty basic tools. I marked and then quilted one block at a time. Feel free to copy this or play with it and create your own tin ceiling quilting design. To start, I stitched in the ditch between every block with clear thread in the top and light-green 50 weight thread in the bobbin. Then I quilted 3/8 inch away from each seam with my white 40 weight polyester thread, using my walking foot. This leaves me with approximately an 8" square open space for my quilt design (original finished block size was 9"). Marking starts with finding the center of each side of the block and making a tic mark on each side. I used an air erasable marking pen from SewLine, but if you are marking more than one block at a time, use a marking utensil that will stay on longer. This one only lasted about 1-1/2 hours at the most. Using a ruler (or another straight line) mark across the block both horizontally and vertically, connect your marked tics. Now I drew a curve from tic to tic. You will need a curved surface to draw against - in this case it is a 6" finished quarter circle template (6-1/2" unfinished). I tried various circles - plates, embroidery hoops, etc. but this worked the best. A simple compass could also be used with the center at the intersection of the lines and marking end set at one of the tics. Draw the quarter circle on paper and use it to make yourself a plastic or cardboard template. Mark all four quarters the same way. Now turn your template and mark each quadrant again from tic to tic. Using a straight line, again mark from tic to tic giving each football shape a center line. Matching each point to a line, draw the shape onto the block. For the inner shape, I simply moved the shape towards the center and retraced the curve, leaving a space somewhere between 1/4" to 3/8" - depending on what you like. Repeat for all 4 sides. Here is my finished drawing - ready to quilt! Start on any tic line. I'm using Magnifico 40 wt. polyester embroidery thread in the top and Bottom Line 60 wt. in the bobbin. Both are white. I quilted the outer lines first. Following back to the beginning and then starting the inner curves. Once again all the way around the block, back to the beginning. And then do the straight line centers, again back to the beginning. Now it is time for feathers. I just fill the space on one side of shape. Each plume will be slightly bigger than the one before until you reach the center of the shape, then they get gradually smaller. 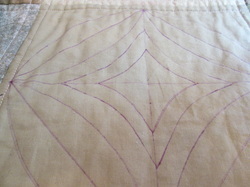 Continue from shape to shape, quilting feathers along one side all around the square. Once back to the beginning, start the plumes for the second side. Once the feathers are done, you are finally ready to tie off your threads. It would be possible to quilt along the center line to get to the center shape, but I decided not to do this. 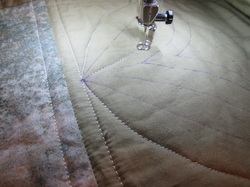 Start at one corner of the center design and stitch all around the outer line of the shape. Once back to the beginning, I traveled along the center line to the inner shape, but you certainly could stop the thread line and start over on the inner line. When the inner shape is quilted, I filled the center with a design. I used 6 different designs on my quilt - one per row. The designs were spirals, water meander, shells, curvy u-turns, a daisy and radiating straight lines. Here is the block finished, with the shells in the center. Pick any design you like for the center.